Over the past decade, remotely piloted aircraft (RPA), also known as unmanned aerial vehicles (UAVs) or drones, have redefined modern warfare. The U.S. Army's drone armada alone has expanded from 54 drones in October 2001 to more than 4,000 drones performing surveillance, reconnaissance, and attack missions in Afghanistan, Iraq, and Pakistan. There are more than 6,000 of them throughout the U.S. military. The U.S. Air Force has now logged well over a million hours of drone flight time. The Department of Defense 2012 plan calls for "purchasing more of the existing unmanned aircraft systems for current operations, improving the systems already in service, and designing more-capable unmanned aircraft systems for the future." The Defense Department will spend an estimated $36.9 billion across its different branches on 730 new medium-sized and large drones through 2020. The U.S. military first developed modern drones in the last century, but large-scale deployment began after 9/11. 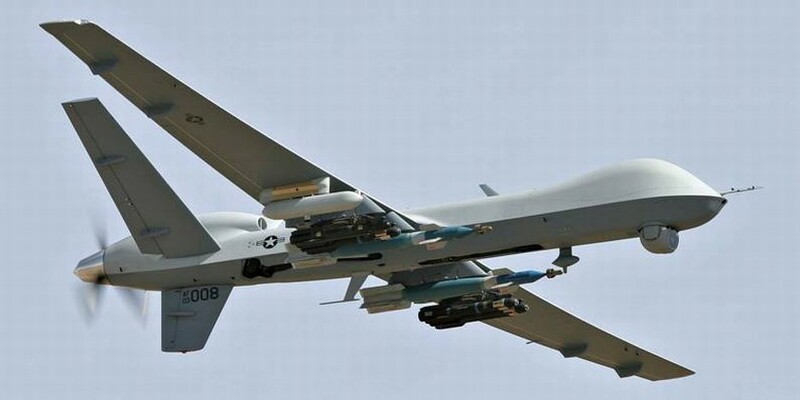 General Atomics Predator drones were first used in Afghanistan in October 2001 to provide intelligence and a strike capability to Operation Enduring Freedom. The Air Force now operates at least four different models of medium-sized or large unmanned aircraft. In addition to its 175 Predators, there are 14 jet-powered Northrop Grumman RQ-4 Global Hawks. About 40 General Atomics MQ-9 Reapers (blog 2010 March 14) are planned to enter the fleet this year. The Air Force also uses the Lockheed Martin RQ-170 Sentinel. Last year, the Air Force trained more RPA pilots than fixed-wing pilots. RPAs are often equipped with full-motion cameras, infrared cameras to provide night vision, signals intelligence sensors to eavesdrop on communications, and a variety of other sensors. In addition to a pilot, each RPA has a sensor operator who directs the cameras and signals sensors during a mission. All of this information is fed to "exploiters" who analyze it and feed it as needed back to the pilot and sensor operator. The U.S. Army operates Northrop Grumman MQ-5B Hunters, AAI Corp. RQ-7 Shadows, and two different types of Predators. The Army will spend an estimated $5.9 billion in the next five years to add to its drone fleet. The Navy is testing the long-endurance Broad Area Maritime Surveillance (BAMS) aircraft, based on the Global Hawk, and the Northrop Grumman MQ-8B Firescout unmanned helicopter. Navy plans call for purchasing 65 BAMS through 2026 and 168 Firescouts through 2028. Troops on the ground can communicate with dronies via Remotely Operated Video Enhanced Receiver (ROVER) ground stations that combine a ruggedized laptop, software, a handset and a radio for live intelligence. Systems of multiple cameras such as the Gorgon Stare video capture system (blog 2011 January 2) and the Autonomous Real-time Ground Ubiquitous Surveillance Imaging System (ARGUS-IS) can let a ROVER dial into a particular channel or tell a sensor operator to follow a particular vehicle on a particular channel. The Air Force Research Laboratory Air Vehicles Directorate Micro Air Vehicle Integration & Application Research Institute at Wright-Patterson Air Force Base in Ohio is dedicated to the development and testing of micro air vehicles (MAVs). Some MAVs are hand launched while others are even smaller and resemble birds and insects. Even smaller drones are in development. In February, AeroVironment introduced its 16 cm Nano Hummingbird, capable of climbing and descending vertically, flying sideways left and right, flying forward and backward, as well as rotating clockwise and counter-clockwise under remote control and carrying a small video camera. Drones are promoted to the American public as a way to strike against threats to the U.S. without putting airmen or soldiers in harm's way. Another purported benefit of drones is precision. But reports of civilian casualties indicate a limit to their precision. The U.S. government claims that its drones have killed more than 2,000 militants and about 50 noncombatants in Pakistan since 2001. Future drones may fire directed energy weapons, including lasers and microwave systems. Drones will also be able to stay in the air for years at a time, powered in part by lightweight solar cells. Remotely controlled aircraft are here to stay. AR When bots learn to fly Lightnings and Typhoons we'll know GOD is nigh. In his book Predator, U.S. Air Force Colonel Matt Martin gives a unique first-person account of the strange split consciousness of drone warfare. He sits in a control room in Nellis Air Force Base, Nevada, while his mind follows a suspicious SUV down a desert road in Iraq or tails Taliban fighters along a mountain ridge in Afghanistan. The acuity of vision afforded by the Predator's multiple high-powered video cameras enables him to watch as the objects of his interest light up cigarettes, take a dump, or shag a sheep on the other side of the world, never suspecting that they are under observation as they do. Most of the bigger drones now operated by the U.S. military can take off, land, and fly by themselves. The operators can program a destination and then concentrate on the mission while the aircraft does the rest. Packed with sensors and sophisticated video technology, UAVs can see through clouds or in the dark. They can loiter for hours or even days over a target. And they do not have pilots. In the unlikely event that a UAV is shot down, its operator can get up from his or her console and walk away. The U.S. aerospace industry has for all practical purposes ceased research and development work on manned aircraft. All the projects now on the drawing board revolve around pilotless vehicles. The Federal Aviation Administration is considering rules that will allow police departments to start using UAVs within the next few years. Soon your speeding tickets will be issued electronically to your cell phone from a drone hovering somewhere over the interstate. The U.S. Army uses robots to find and disarm roadside bombs, survey the battlefield, and shoot down incoming artillery shells. The models in development include BigDog, a zoomorphic quadruped designed to help soldiers carry heavy loads over difficult terrain, and BEAR, a vaguely humanoid machine on caterpillar tracks that can lift loads of up to 500 pounds. The army is experimenting with SWORDS, a tracked vehicle equipped with a suite of powerful cameras that can be armed with a 50-caliber machine gun or a variety of other weapons. The U.S. Navy is experimenting with robots. It recently unveiled a robot jet ski designed to sniff out underwater attackers. The Navy has developed long-distance robot sailboats packed with high-tech surveillance gear. Robot submersibles could spend months on underwater patrol, parking at the bottom of enemy harbors and observing all the traffic. Researchers are testing UAVs that mimic hummingbirds or seagulls. One model under development can fit on a pencil eraser. There is speculation about linking small drones or robots together into swarms of machines that would share their intelligence to converge instantly on identified targets. Drone strikes in the tribal areas of Pakistan have probably been less successful than U.S. officials claim at killing militant leaders. Polls show that Pakistanis overwhelmingly believe that most of those who die in the attacks are civilians. The number of terrorist attacks in Pakistan has risen sharply as the drone campaign has accelerated. The broader political effects of the UAV campaign may well cancel out some of its tactical benefits. In Wired for War, P. W. Singer discusses not only the technical specs and astonishing capabilities of these new weapons systems but also the broader questions raised by the rapid expansion of military robotics. Military robots are developing considerable autonomy. As sensors become more powerful and diverse, the amount of data gathered by the machines is increasing exponentially, and soon the flood of information will far exceed the controller's capacity to process it all in real time. More decision-making will be left to the robot. Soon our mechanical warriors will be better at protecting the lives of our troops than any human soldier. Once that happens, the pressure to let robots take the shot will be very hard to resist. A fundamental premise of international law is that soldiers in the field and the leaders who direct them must be held accountable for any violations of the laws of war. Unmanned systems muddy the waters surrounding war crimes. The U.S. Air Force currently operates on the principle that a pilotless aircraft has the same rights as if a person were inside it. The next generation of military robots is likely to have more operational independence. Technology is on the verge of supplanting the human soldier altogether. Stealthy drones like the RQ-170 Sentinel that crashed in Iran are very good at loitering over a target of interest for hours on end. That time in the air collecting intelligence helps peel back the layers of a nuclear program. Lengthy video surveillance can reveal much more than snapshots. Drones can fly close to their targets to capture better imagery of the ground below. The extra resolution can yield important clues for intelligence analysts. Drones can also carry sensor packages to sniff the air above clandestine facilities for telltale signs of radionuclides. The development of small and sophisticated sensor packages combined with the ability of drones to fly autonomously makes them a reliable nuclear surveillance platform. Unnamed military sources confirmed that the RQ-170 was conducting nuclear surveillance over Iran. AR Anything that reduces home-side casualties in war is to be welcomed.